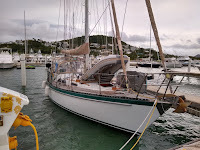 We just finished up nine days in the BVI, on a charter boat, without Windbird or Piper. The former stayed here on the dock in Puerto del Rey, where our dockmates John and Barbara on Mojo kept an eye on her. The latter went off to a doggy resort called Wildane Kennels, up in the foothills of El Yunque, while we flew from San Juan to Tortola. We were on a Sunsail-branded Jeanneau Sun Odyssey 389 named "Lady Meta," courtesy of Moorings charter boat owner friends who heard about our bum engine predicament. 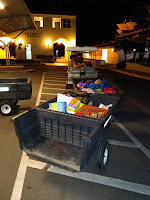 Their generosity was greatly appreciated, but it was still kind've a bummer to be going back to a charter boat. We brought a ton of stuff with us, and I was still constantly wanting various tools or equipment, turning around to get them, and then realizing they were back on Windbird. Plus the Jeanneau felt small, light and cheap compared to Windbird. We experienced some relatively nasty weather over the week and would have appreciated Windbird's solidity. Plus, surprisingly, we didn't find the Jeanneau to be particularly faster or more weatherly than Windbird; we gave her a good workout the last two days, and her performance was roughly the same as Windbird's in moderate to heavy wind. I didn't actually spend a ton of time on Lady Meta; the whole reason we made the trip when we really would have rather been back in Puerto Rico with Windbird was because my brother Steve had put together a sailing trip on a 48' Leopard catamaran with ten of his friends - only one of whom had sailed before - and he needed my sailing expertise to be able to handle that boat. So I checked Dawn and my brother Jon and his girlfriend Heather out on Lady Meta the first day, then spent the next four days as supervising skipper and sailing instructor on S/V Shipyouknot. Only on the last two days did I cut Steve loose and return to the Jeanneau, which Dawn, Jon and Heather really appreciated. They'd been having a tough time keeping up with the cat in windy, choppy, squally conditions that were challenging for an experienced skipper, nevermind one solo for the first time with fairly green crew. It was frustrating for them to bash for hours only to find the cat arrived an hour earlier, with our crew well into party mode without them. Sailing the cat was pretty interesting. I've done a few charters on 39-46' Leopard cats, and served as crew on a few others, but always got the impression they were pretty slow and clumsy to windward. Maybe I was just in too light of conditions, or still green and uneducated in sail trim. This time I seldom touched the helm or sheets, but gave instruction to all those interested, and we were able to do really well going to windward in 13 to 23+ knots of wind. When sailing "against" similar charter cats aboard Windbird this spring, I observed that they had a couple knots of boatspeed over us but we pointed nearly 10 degrees higher, generally getting passed off the wind but beating the cats to the upwind mark. This time we were doing 3-4 knots over what Windbird would do in similar conditions and pointing within 5 degrees (58° true wind angle vs 53° for Windbird), for overall better upwind performance. One thing I initially disliked about the cat but which eventually made sense was its dual mainsheet system, with both sheets fed to a single manual winch. The upwind sheet serves as mainsheet, while the downwind sheet augments the boom vang to control sail twist. The dance of which sheet to put on the winch when gets a little getting used to, especially for jibing. The Jeanneau, meanwhile, had a double-ended mainsheet with each end fed to the primary winches near the helms. The upwind winch is generally used to trim the mainsheet - but again this results in an interesting routine during a jibe. There were a few changes to the BVI since our visit in April. The islands continue to grow back more foilage and get more lush. I saw fewer structures missing roofs, and reconstruction in Road Town is proceeding apace. A lot of sunken and beached boats have been cleared out, although quite a few still remain. The Great Irma Trash Heap on the southwest side of Tortola is much smaller. The Willy T is back, bigger and better, with cheaper drink prices(!) and this time moored in Peter Island's Great Harbour. Suddenly Peter Island is popular, while The Bight at Norman Island looked deserted both times I saw it. There are rumors the Willy T will have to move again due to complaints by the Peter Island Resort, who apparently did not learn the lesson of Pirate's Bight. The Bitter End Yacht Club in North Sound has torn down all its wrecked structures in preparation for rebuilding, while Saba Rock hasn't seen much progress. Soggy Dollar added a few new palm trees but still feels quite different than the old one. Quito's Gazebo in Cane Garden Bay is almost rebuilt, and Myett's (newly sold to Pusser's) nearly has their second story back on. Anegada Beach Club is its old peaceful, welcoming self. The seven day charter circuit can really be a slog, especially when you include the long sail to and from Anegada in challenging conditions. 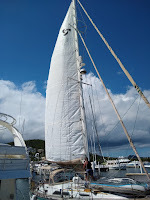 Dawn and I much prefer the "BVI Slow Cruise" we practiced aboard Windbird last season. Still, it was a lot of fun to introduce both sailing and the BVI to a boatload of newbies, who were all blown away by the experience. We finished the week with two days of Dawn and I racing Lady Meta against the cat crew, and while we were faster, it was pretty cool to see them sail the boat by themselves. The whole time we were thinking about Windbird; we made a decision about her engine, and set about implementing that decision (which I'll write about soon). We were pretty happy to get back to her (and Piper) today; there's no place like home, which is definitely what Windbird is to us now. Our drive to Atlanta went well on October 23-25th, and the flight down to San Juan PR on the 26th went off without a hitch. Well, not quite - we bought a cheap ticket on SWA for Dawn since all the flights on my airline were oversold. I was on a jumpseat pass on the same flight we had paid to have Piper shipped as cargo, and it turned out there were plenty of seats due to misconnects - we didn't have to pay for Dawn after all. Oh well. Piper did very well with being shipped, again. 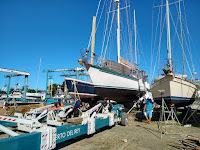 Our four days in the boatyard were hot, dusty, and busy. The boat was a little dirtier and moldier than we realized, so Dawn had some work cut out to make it habitable. We steadily worked our way down the long project list and got everything done by our scheduled launch at 3:30pm on Oct 30th. In the week since I had last visited the boat, mechanic Gerry Martino had finished flushing water out of the crankcase, removing water from the top end, and lubricating the cylinders through the injector holes. He also installed a new raw water throughhull and seacock, the job whose estimation (my another mechanic) led to the initial discovery of the water in the bilge. Gerry very briefly ran the engine while the boat was on the hard; I was really worried about internal rusting and potential damage down the road. As it turns out, I was right to worry. The launch went very smoothly. Once in the water, the engine started right up but smoked heavily, which I initially attributed to the extra oil Gerry had injected into the cylinders. It made decent power to get us to the dock, though, and we were quite happy to be off the hard and moving aboard (we had spent the previous nights in a rented apartment about 10 minutes north of the marina). 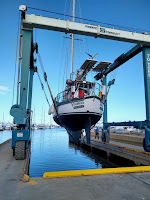 Over the next few days we continued provisioning, rigging Windbird to cruise, I fixed the air conditioning and it promptly broke again, and we kept running the engine at various RPMs. 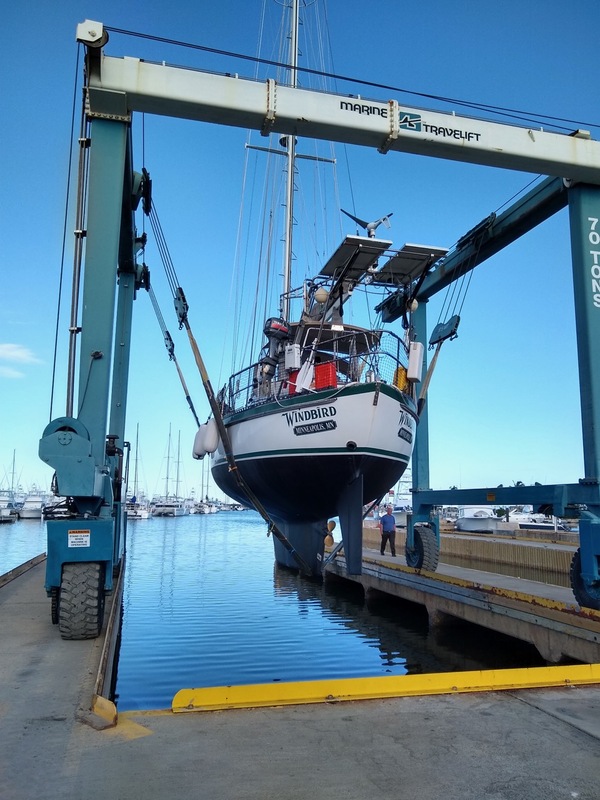 Our initial goal had been to leave the marina on Friday, October 2nd, and we would have been ready to do so if our engine had been running right. It was still smoking quite a bit and running a little rough, and there was a pronounced top end clatter. Gerry came to adjust the valves on the morning of October 2nd and that cleared up the top end noise, but now the roughness of the engine was more evident. He isolated the problem using the old "crack the injector hold-down" trick: the #4 cylinder was dead. 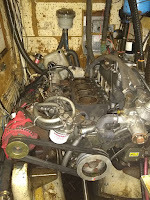 The next morning he came back to swap injectors (between #2 & #4), but the #4 cylinder stayed idle. The injector was clearly squirting out fuel. This left compression as the primary suspect, a very bad sign. We hung out the rest of the weekend as it rained and poured, and on Monday morning Gerry and his assistant David came with their compression tester. Cylinders #1-3 all showed around 425 psi, while #4 registered just under 300. Exploratory surgery was necessary. Gerry and David tore out the head and took that back to their shop, where Gerry inspected it yesterday. He found all valves seating and sealing normally, and no leaks from the top end. This is the worst case scenario. It means a broken ring, possibly a scored cylinder wall (we can't see any evidence of that from the top of the cylinder, though). It means removal of the engine for overhaul, or else replacement. It means putting a ton of money into the boat, and being stuck here for the foreseeable future. It means our plans for this season are on hold for now. Because the current engine has nearly 8500 hours on it, Dawn and I are strongly leaning towards replacing it with a new Yanmar 4JH5E, which is basically identical to our current 4JH4E. It would be about as painless of a repowering as is possible. We'd be able to use our brand new ZF 15 MIV transmission, which thankfully survived its own dunking without water ingress. We'd possibly even be able to leave the boat in the water, as Mark and Judy Handley did when they installed the current engine in 2005. We know the engine will fit through the companionway and down the aft cabin passageway to the engine room, which would have to be partly disassembled. 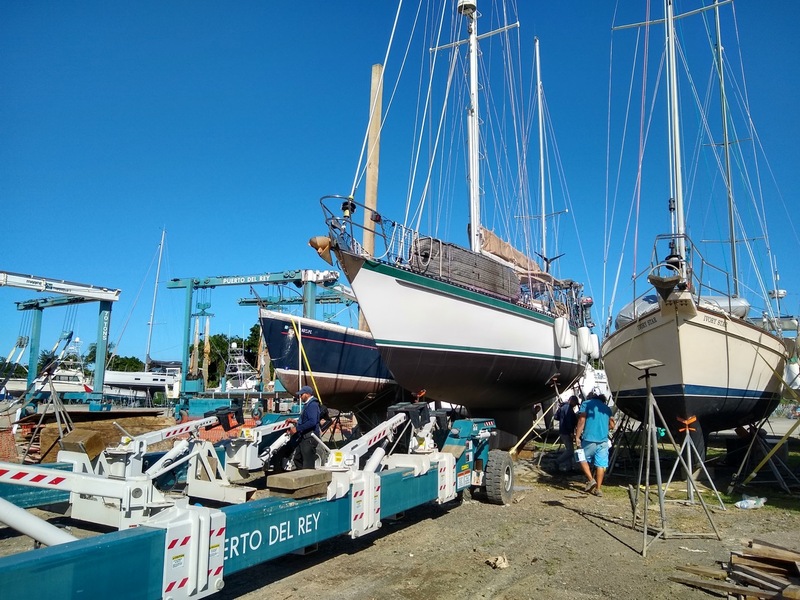 We know it can be done with our main halyard, a few other ropes, and a 1-ton chain hoist. We have lots of photos and descriptions of the process from Judy's blog. It would allow us to do a few other projects to greatly improve our engine room and bilge. But it would doubtless take a while to be shipped down here. We're waiting on a quote from R&B Power in San Juan. In the meantime I'm starting the process of filing an insurance claim. That's going to be interesting, as our insurance has been a pain to deal with every time we've had contact. We would have switched if it didn't require a new survey. In the meantime, though, we're flying over to the BVI for 10 days. Two of my brothers and eleven of their friends are flying in for a charter of a large Moorings catamaran on Nov 10-17th. Windbird was supposed to join them but obviously won't be making it, and besides their need of our sailing expertise there isn't enough room on the cat to sleep everyone. 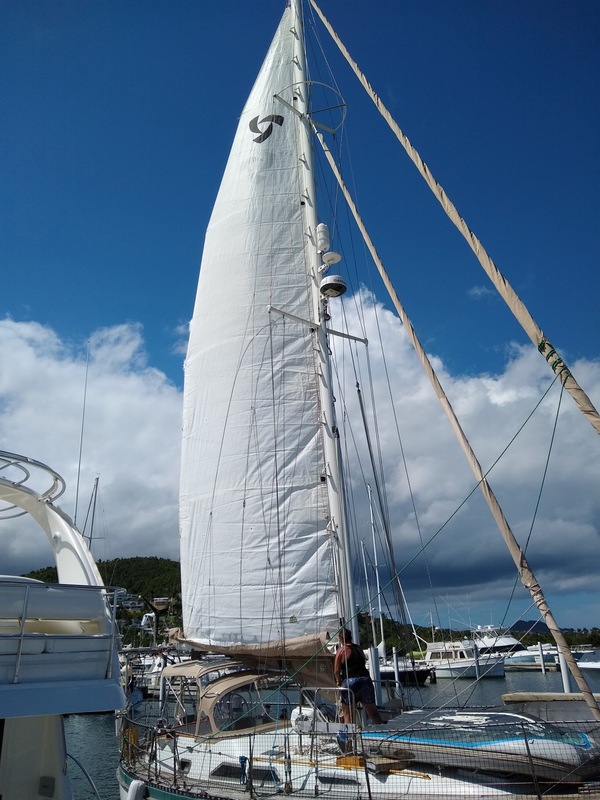 Fortunately some good friends of ours who are also Moorings owners gifted us the use of their points to charter an additional 38' monohull, which Dawn, my brother Jon, his girlfriend Heather and I will sleep on. Piper will be going to a "doggie resort" here on Puerto Rico. Though we're getting the extra boat for free, I honestly hate to leave Windbird here like this and run off to the BVI, but we're doing it because it's family and they've had this planned for a long time, have nonrefundable tickets, etc. My hope is to get the new Yanmar ordered and headed this way while we're gone, assuming we decide to go in that direction. We'll be trying to make a decision in the next three days.